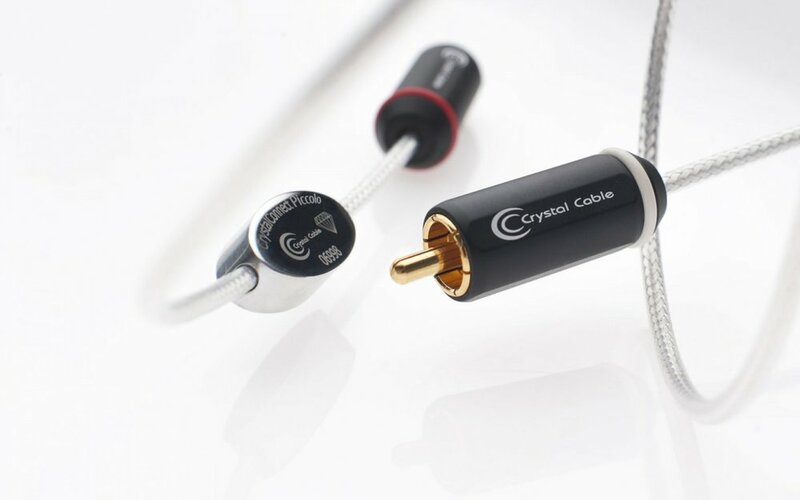 Crystal Cable is a unique and exceptional brand on the high end audio market. Technology, musicality and unexpected design are the key values, differentiating Crystal Cable’s cables, loudspeakers, electronics and products for the portable high end audio market from other brands. With strong family ties to the Siltech Cable brand, Crystal Cable benefits from Siltech’s 35 years of research and development into materials for use in high-end audio cabling. Made exclusively in Holland, Crystal Cable uses a customized silver-gold alloy as its primary conductor material, to smooth silver's crystal boundaries. In the top Dream Series, extreme high quality mono-crystal silver is the conductor material, with high tech Kapton and Peek insulation and all monocrystal shielding. In addition, elegance has also been redefined so the cables blend seamlessly into any home environment where both design aesthetics and high-quality performance are of equal importance. State-of- the-art research capabilities offer both a unique capacity for the development of proprietary materials as well as the ability to create individual solutions. The cables are beautiful to look at, easy to work with and flexible to wear. /portable IEM and headphone cables/.This ensures that Crystal Cable products are not only visually simple and elegant, but also deliver ground-breaking sonic performance, life-like musicality. Crystal Cables simply deliver sound that is dramatically more musical, more natural and more communicative than the majority of products on the market today. When it comes to performance, people say “less is actually more” and Crystal Cable’s range definitively proves just that. The Diamond Series is the ultimate audio expression of that philosophy. By using unique, high-tech materials in radically different combinations they can eliminate unnecessary elements and the undesirable side effects they entail. All cables within the Diamond Series feature a patented metallurgical process that injects pure gold in between silver crystals. 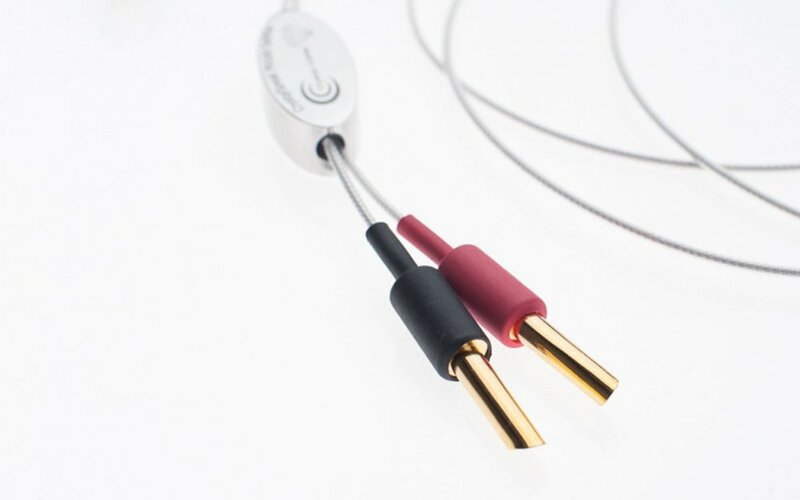 This advanced metallurgy - which is a unique breakthrough in the high-end audio market - developed by and exclusive for Crystal Cable and Siltech, prevents the crystals from oxidising. This ensures that the electrical behaviour of the sound signal remains constant over a very long period of time while simultaneously reducing micro-distortion. The piccolo diamond might be their most affordable high-end cable, but it still embodies every important aspect of the DIAMOND philosophy. The number of awards it has garnered over the years proves that its minimalist construction and elegant appearance deliver a remarkable audio performance. The silver-gold alloy used in the central core makes a superb conductor, but such advanced metallurgy comes at a steep price. The piccolo diamond uses the thinnest conductor dimensions compatible with full-bandwidth and dynamic range. Flexible and easy to work with, it is only available in asymmetric configuration (RCA, not XLR) but even this most affordable Crystal Cable is serial numbered and certificated to guarantee authenticity and the performance you’ve invested in so that your audio system always sounds its best. The Micro Diamond might not look much thicker than the Piccolo but appearances can be deceptive. The same minimalist construction combines a superb RFI and EMI shielding with the least possible insulation material which conceals a central core that reduces resistance and micro-distortion. Furthermore, it increases the mechanical integrity of the cable in order to help combat storage losses, while at the same time it enlarges the surface area for an improved high frequency performance. This in turn results in a greater bass extension and higher weight, which delivers improved musical substance and presence. Furthermore, the increased audio-resolution, spatial definition, instrumental harmonics and air all add to the completeness of the musical experience. Like all Crystal’s hifi cables, your investment is guaranteed by individual serialisation and certification. Their heaviest single core cable – Reference Diamond – is based on a solid silver-gold conductor. This conductor is wrapped in the same Kapton insulation, shielding and Teflon outer as the other Diamond Series cables. The result is extremely low levels of micro-distortion, resistance and mechanical energy loss. The cable produces superior presentation of time and phase information, spatial resolution and musical detail. Yet, the Reference Diamond cables are incredibly flexible, easy to handle and consistent in performance. It entails none of the rounded, softened, exaggerated or slurred sounds that is typical for bigger and bulkier high-end cables with stranded conductors, extra fillers and insulation. That and serial number production ensures that your audio system always sounds its best. The Ultra Diamond is their first twisted pair cable. It combines two Reference conductors, each with their own shielding and insulation. Unlike most twisted hifi cables, they do not use an external sleeve. Because of this, they eliminate extra unnecessary materials and create the Ultra’s distinctive rope-like appearance. 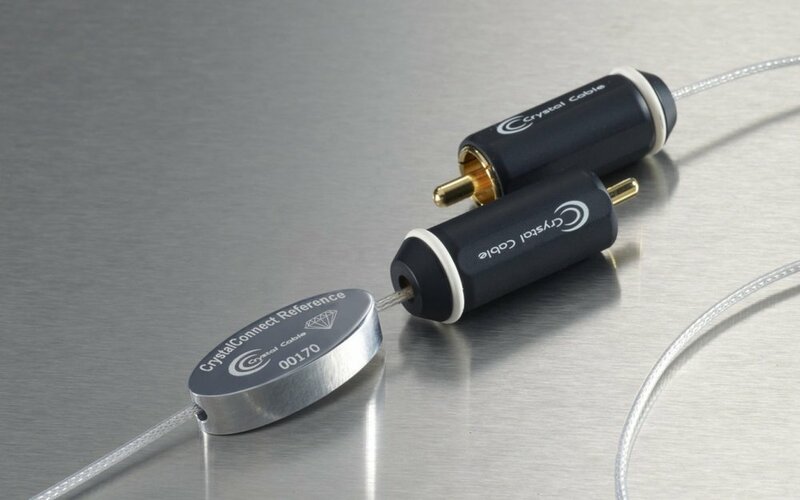 The second silver-gold solid core provides a significant reduction in ground impedance, which helps to lower the system noise floor, and also anchors the time domain for a better rhythmic integrity, phrasing and musical flow. While doing this, the Ultra maintains the Diamond mantra of minimalist construction and minimum losses to mechanical interference or dielectric effects. The frosted acrylic blocks with individual serial numbers and certification, ensure that your Ultra Diamond cable is manufactured and terminated to their standards in Crystal Cable’s Dutch factory so that your audio system always sounds its best. Crystal Cable has always been recognized for the purity of its products' sound, the lack of grain or overhang, smearing or exaggeration. Conventional wires suffer from micro-distortion, caused by the build up of pockets or layers of oxidation or contamination between atoms and metal crystals. These discontinuities are responsible for tiny shifts in electrical behavior and signal transmission, small shifts that are only too audible as grain overlaid on the music or a lack of rhythmic confidence. The original Crystal cables used sophisticated metallurgy to create an advanced silver-gold alloy that substituted gold atoms for the voids or junctions in the silver crystal matrix, delivering fantastic purity of sound as well as consistency and longevity of performance. But what could be better than filling those voids? Eliminating them altogether! Crystal Cable has finally perfected the art of creating monocrystal silver conductors in which each solid-core wire is a single, continuous crystal structure, completely eliminating crystal boundaries and voids – and the micro-distortions that go with them. For us, this technology was the realization of a dream, the perfect conductor they’d been working towards for years. The challenge then was to make it into a dream that you could share. To achieve an even higher performance level and reduce distortion even further, Crystal Cable created hifi cables using an all pure-monocrystal core. Since there is only one large crystal, there is simply no unnecessary space between atoms, meaning an unprecedented reduction of any distortion. The pure monocrystal silver core is protected with Dupont’s Kapton and PEEK as dielectrics and is further safeguarded with two additional shielding layers. One layer consists of silver plated monocrystal copper and the other layer consists of gold plated monocrystal silver. The braid is secured by a transparent sleeve giving the cable its unique appearance. DREAMLINE PLUS cables use two of these conductors, twisted into one cable. It radically reduces micro-distortion, rhythmic discontinuities and grain and massively improves the musical performance only to let you enjoy your music in an effortlessly natural and fluid way. Each ABSOLUTE DREAM interconnect and speaker cable employs four of Crystal Cable’s unique mono-crystal silver conductors (with dedicated designs for digital and power applications) for the best possible signal transmission and lowest possible resistance. In addition, Crystal Cable licenced connector specialist Furutech to create custom connectors that embody the minimalist, low-loss ethos, longevity and mechanical integrity of the mono-crystal silver conductors. The ABSOLUTE DREAM connectors use rhodium-plated mono-crystal copper connections, low-loss Teflon insulation, low-mass carbon bodies and non-magnetic stainless steel or eutectic copper housings. The result is a range of elegantly minimalist plugs that eliminate the last (and often overlooked) weak link in the signal transfer chain. The ABSOLUTE DREAM is a cable in which every single aspect of its design and construction has been reassessed with a single purpose – to be the best. Ground-breaking metallurgy and materials, a unique approach to construction, unrivalled longevity and geometrical consistency and the refusal to accepts conventional solutions or established thinking have resulted in a totally new level of high-end audio cables and hifi audio system performance. The journey of engineering and listening tests to achieve a balance in sound is a long one - leaving all compromises behind. Every new cable with new materials and configurations has to be tested with various audio equipment to find its weakness. Through extensive research in magnetic field behaviour, modelling with sophisticated Multiphysics software (Comsol®) and using the best ultra-pure rare earth conductors, their engineers reached a revolutionary level of performance and sound. 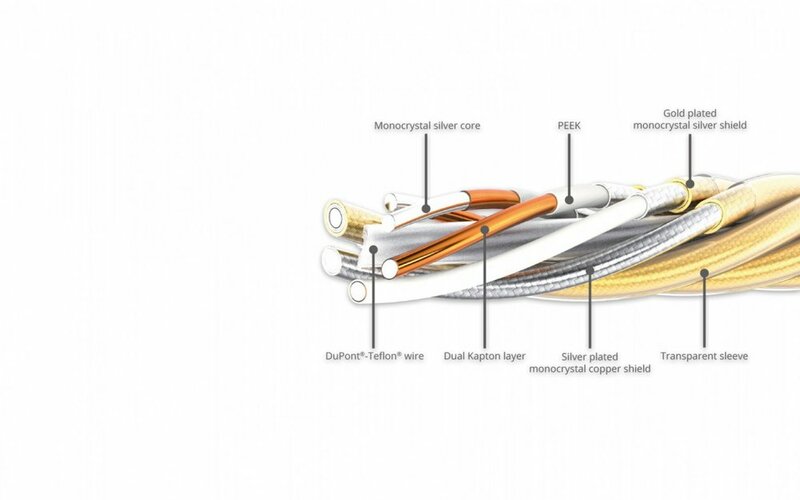 Crystal Cable’s engineers perfected the art of creating monocrystal silver conductors in which each solid-core wire is a single fluent crystal structure. This completely eliminates crystal boundaries and gaps, thus removing the micro-distortions that go with them. With The Ultimate Dream Crystal Cable has created a new flagship series which incorporates the highest level of technical advancements and construction, to provide unrivalled sound quality and purity in the high-end audio world/market. The Crystal Cable Special Series allow Crystal Cable to bring music to every system and installation situation as they are all available terminated or on bulk spools of 50 meters for easy termination in the field. With their high-purity silver-gold alloy or silver-plated OFC copper conductors, these cables are very reasonably priced. The range offers the entire suite of Interconnects (RCA, XLR), Speaker (Spade, Banana), Power (EU/US/UK), and Video/Digital (BNC, RCA) cables. Many companies have tried to build speakers from glass, drawn by the stunning aesthetics that result, but none have succeeded in matching those looks with stunning sound to match – until now. Using the most advanced modelling software available to analyse structural behaviour and gas dynamics has enabled Crystal to create loudspeaker cabinets with unprecedented control over the resonant behaviour of both the enclosure and the air volume inside it. The same low-loss philosophy that governs Crystal’s cable designs informs the elimination of internal damping from the speaker cabinets, maintaining detail, dynamic range and musical immediacy. Innovative crossover designs that protect the phase relationships within the music, preserving its natural life and vitality, combined with Crystal Cable internal wiring within the speakers, the crossovers and in some cases, within the drivers themselves, remove further sources of intrusive disturbance, allowing your music to emerge beautifully complete and intact. Crystal’s loudspeakers – simply making more sense of the music. With Crystal Cable Portable DUET they take on the challenge of high-end in portable products. • Combining the portable high-end and home high-end world. • Combining super high purity gold and silver conductors for deep base and extremely detailed sound. • Combining high-tech technology with eco-friendly materials. • Combining extreme durability with ultra flexibility. 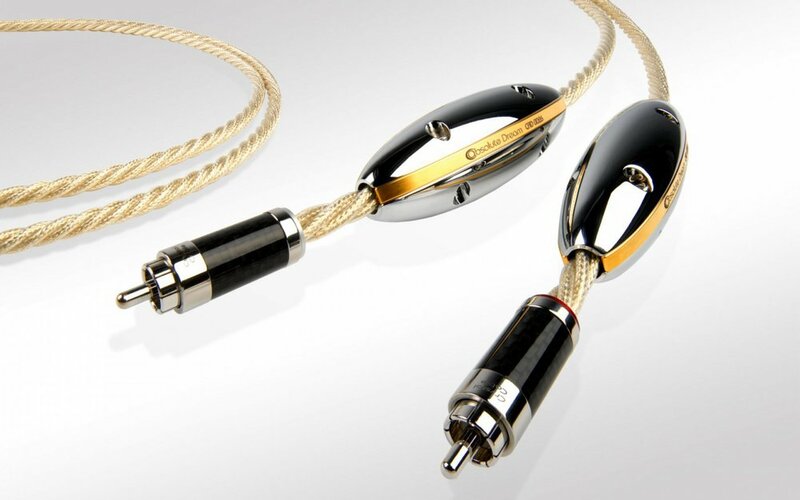 • Combining high-end Oyaide connectors with all kind of headphone and IEM termination. The superb conductivity, shielding and high-tech insulation materials used by Crystal Cable are perfect for the low-signal level and low-power applications which are typical in portable hifi audio systems; flexible and thin but also very strong and extremely musical. Its high-end Oyaide connectors can be combined with all kind of headphone and IEM termination making sure Crystal Cable’s trademark qualities are aligned with the same philosophy; to bring live music to the listener, be it through an audio system at home or one that you take with you.